Jake's father disappears while working on mysterious experiments with the obsessive, reclusive Oberon Venn. Jake is convinced Venn has murdered him. But the truth he finds at the snow-bound Wintercombe Abbey is far stranger ... The experiments concerned a black mirror, which is a portal to both the past and the future. Venn is not alone in wanting to use its powers. Strangers begin gathering in and around Venn's estate: Sarah - a runaway, who appears out of nowhere and is clearly not what she says, Maskelyne - who claims the mirror was stolen from him in some past century. There are others, a product of the mirror's power to twist time. And a tribe of elemental beings surround this isolated estate, fey, cold, untrustworthy, and filled with hate for humans. But of them all, Jake is hell-bent on using the mirror to get to the truth. Whatever the cost, he must learn what really happened to his father. This is a middle grade book, right? For some reason I thought the characters were older teenagers, but it all read very young. 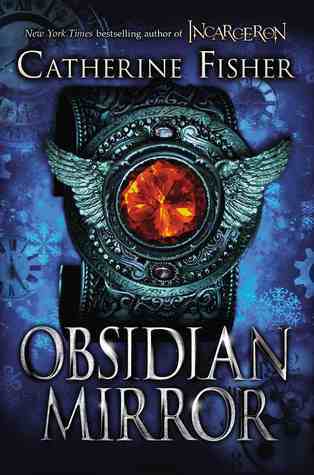 Other than that, Obsidian Mirror is a hodgepodge of story plots jammed together and tied by a obsidian piece of glass. There is time travel, fae, a potential apocalypse, a few pages of boarding school intrigue, Victorian drama, mad scientist type people, a kidnapped boy, a plot to change time, and many other things. Looking back, I’m not sure how it all fit together, but the story reads well and somehow manages to fit together into a book with a lot of characters for a middle grade book. It all revolves around Jake, a distraught boy with a missing father who has just attacked a fellow student to get sent back to England to live with his hermit god father. Somehow his teacher, an ex-military man who now teaches drama to privileged school boys, gets roped in and sent back with Jake. They arrive at Oberon Venn’s house soon after a runaway named Sarah has climbed through Venn’s study window after being chased by a wolf and creepy soldier. Venn lives as a shut in with his servant, who makes random mention of being owned by Venn. Another man, named Maskelyne, seems to be around every corner, hoping to get a hold of the mirror while Rebecca, a townie, pops up regularly when she’s not necessarily wanted. Then there’s Gabriel, Summer and some assorted fae characters wandering in an eternity summer forest in the middle of the Venn estate, currently disappearing beneath an epic blizzard. But the characters are just pawns to move around a gameboard full of time travel and hunting down Jake’s missing father. The Venn estate is full of mysteries from generations before, but they aren’t really explored. The mysterious servant is never really utilized nor is his series of identical cats that wander around the house. Instead all the mystery revolves around the obsidian mirror of the title, an object that opens holes in time that has characters popping back to Victorian times to get in fisticuffs with hooligans and meet a charming moppet, who helps Jake and Venn out of situations their naivety gets them into. The book moves fast and it never gets too deep. The characters are mostly surface level, mostly because there are too many to fully explore any of them for much time, much less the complicated relationships glimpsed. The fae are mere background characters and not utilized, popping in when a fantasy element needs to be added to the time travel. It feels like this could have been easily bumped up to YA with a little more depth, but the surface level characters and lack of emotions in the story are usually common in the Middle Grade fiction I’ve read. Each chapter starts off with a fictional quote from documents associated with the story – interviews with Venn, who was previously an epic explorer, histories about the Venn estate’s history and journals from those who either created or obtained the mysterious mirror across the centuries. It’s clever, how they fit in with the action that’s yet to occur and probably give more insight into the character, particularly Venn and his association with the house and mirror. Fisher’s writing is compelling and allows the story to fly by with the action rarely slowing. It’s the easily flowing writing that makes this book enjoyable. I just wish there had been a lot more substance to hang on to. This is a great middle grade read with fantasy elements and time travel that isn’t complicated. Anyone looking for fully realized characters should look elsewhere, but for an exciting story that relies more on action that character development, Obsidian Mirror is a good start to an adventure series. I wouldn’t put this near the quality of Incarceron, but I can see this appealing to reluctant readers wanting adventure. I received an advanced copy of this book through the Around the World ARC tour in return for an honest review. I've since passed it on.